We are creating a concept for a piece of fire fighting equipment and need two illustrations showing how it works. The equipment is a &#039;Fire Barrier&#039;, which is meant to protect property neighboring a burning building from its thermal radiation in order to prevent the spread of fire. The barrier consists of two extendable (telescopic) poles held up by tripods, that are placed between the two buildings. A fire resistant drape is raised between the poles to erect a barrier that protects the property behind it fro the fire. The poles can be raised up to 8 meters in height and have a wheel at the top that allow the user to hoist the drape, similar to sails or a flag. The drapes have holes along its sides and top/bottom through which the hoist rope is clipped on. The drape is also attached to the bottom of the pole through the holes once it has been raised. Please see attached collage with drawings for details. Please include color in the illustrations. -- Illustration 1: The barrier from its side with two houses on either side, one of which should be on fire. The fire should have red squiggly arrows coming from it to show that it is emitting thermal radiation (see angle of barrier and details in attached collage). The fire barrier needs to contain all details described above and seen in the collage. 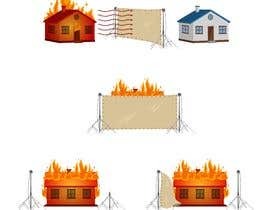 -- Illustration 2: should show the fire barrier from the front with the burning house behind it (see attached collage). Likewise it needs to contain all details described and shown in the collage. -- extend the drape all the way down to the ground so there is no gap in both illustrations. -- DOn't make the gap between the sides of the drape and the poles too wide. -- Make the drape beige in color. -- Make the houses in illustration 1 the same angle as the fire barrier, and make them all align (ie. the houses should NOT only be showing one side '2d' as in the drawing) (Example here: [login to view URL]). -- Add red squiggly arrows from the burning house towards the fire barrier to illustrate the emittance of heat radiation (Example here: [login to view URL]). -- If possible, add a red hue/gradient around the burning house to show heat radiation (Example of hue/gradient here: [login to view URL],w_800,f_auto,q_auto/v1505864592/[login to view URL]). 1. the two poles standing in front of the burning house without a drape attached, with one of the pole's legs folded up. 2. The two poles standing in front of the burning house with the drape only attached to one of the poles and the rest laying on the ground (like a loose sail. Example: [login to view URL]). The additional illustrations are meant to show the sequence of how the drape is set up.